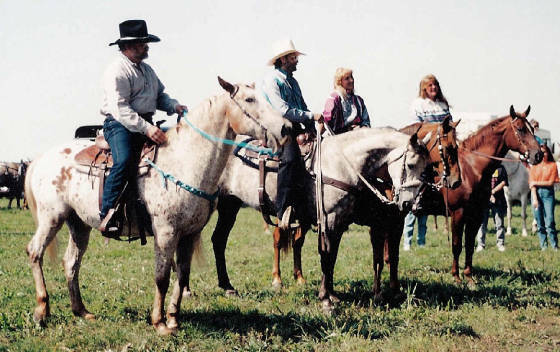 Mark & I have been riding & raising Missouri Fox Trotters for over 20 years. It's how we met & we were married on our horses 4 years later. Hello, my name is Brenda Nilsson & I would like to welcome you to our web site. For starters you can check out our stallion Mystic Moon. He has been our herd sire since 1993. He is a easy guy to handle & a pleasure to be around. I have a page that shows several pictures of Moon's colts, visit it & see what he has produced. There is also two For Sale pages with a few of Moon's babies that are available plus a few other nice Fox Trotters. We are located north of Buffalo MO on Hwy 73. Drop me a note, come & visit. See what our breeding program can do for your next trail, show or family horse. I am always updating our site so check back every so often. I will add new pictures and information as much as I can. Thank you for your patience & for your visit. Thanks for dropping by to see what we do & what we have for sale.